Many of the fakes being made today start out as reproduction tomahawks which are then altered to make them look old and authentic. Since the internet made this practice more profitable it has become that much more prolific than ever before. Fakers have been buying reproductions (cast and hand forged) in bulk and selling them as authentic particularly on places like Ebay and other auction houses and collector shows. 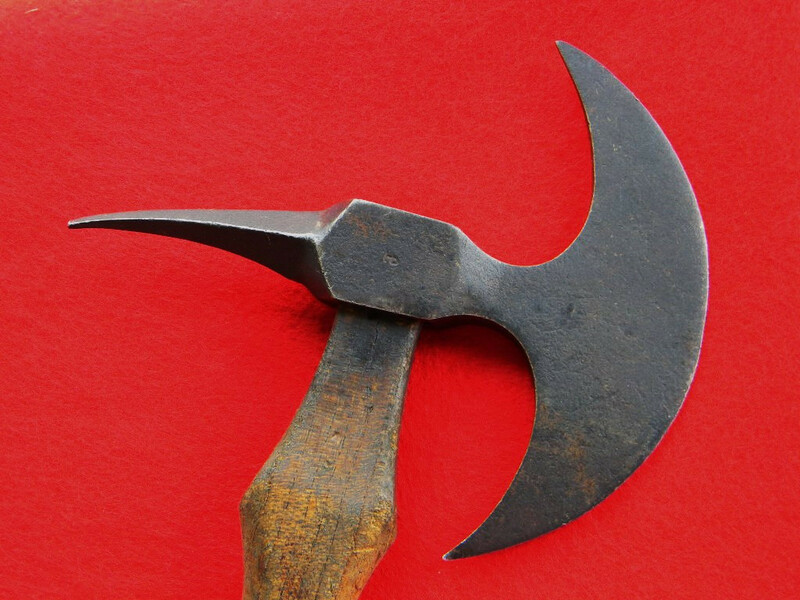 One reproduction specialist who makes legitimate hand forged reproductions told me one person wanted to buy a large number of his tomahawks without their maker's mark on it! Clearly the intent was to remove evidence of its true identification. To the maker's credit he refused to do so but not all reproduction makers would have. Many reproduction tomahawks are filed, altered, notched, polished, pitted...anything to make them look different from the original repro. The next 4 photos are of the same exact repro. altered by different people. Like many reproductions it was molded from an original, from the 1890's in this case. The 1st photo is one that was made of cast iron and sold as a reproduction. The 2nd one is the same except it was partially filed down, altered and the haft was stained with wood dye and was sold as authentic. I can overstate how many of these altered pieces are now circulating. These cast iron & steel fakes have appeared in nearly every auction house, show & of course ebay. 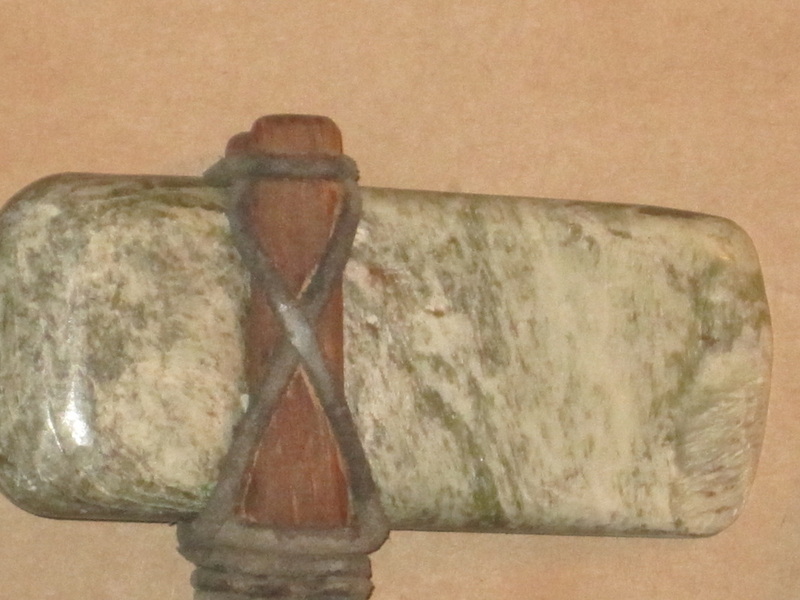 Except for some rare examples the cast iron pipe tomahawks were used primarily in the 20th & 21st. C. as repros., tourist items or much more rarely on the rez. Perhaps as many as 95% of the ones currently seen are from the last 50 years. They were however cast in brass & pewter throughout the historical period and after. The Bessemer Process for making cast iron invented in 1850 in England and was a huge advancement. It made the material finally economically viable however due to patent lawsuits it wasn't until 1865 that the first U.S. company was able to begin making cast iron using the Bessemer process. 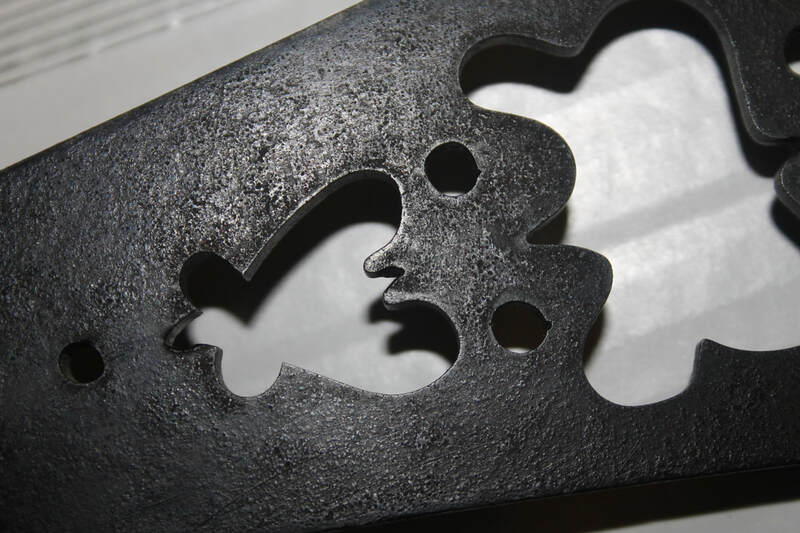 "Cast iron" is both a process and a type of iron. While cast iron was available before this time it was not remotely popular until after 1890 and far more so in the 20th C., probably due in large part to its brittleness. Most, if not all of the reported old & 'forged' examples I've seen were either actually cast iron or were much newer than they were reported. Some are even scored to simulate forging. One of these brass/bronze examples appears to be shown mistakenly as authentic on page 180 Fig. 25 in the Hartzler & Knowles book. This style head has been showing up more frequently in the last few years from the U.S. to Germany. Some have the spur shaped more but they are from the same mold. I see one up for sale on ebay today for $3,000 or best offer from a prolific seller of fakes. They are available new online for ~$45 & hand forged in India. Cabelas sold this one around 2011. Take note of the scored marks on sides of triangular blade. The head is 9 1/2" x 4". 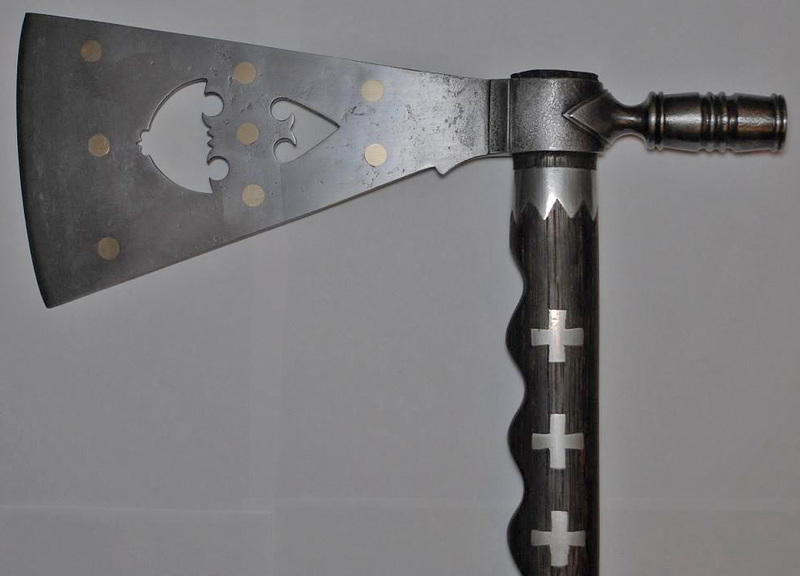 Here is another ice hatchet made for the home user to chip ice chips off the block which is often misidentified as a spike tomahawk. Most show up with missing handles or replaced ones, but the one pictured below has its original pine 15.5" handle. The head measures 5.125" long x 1.625" wide with an oval eye. Its total weight including the handle is 5 ounces. There is no taper in the eye. One of these is also unfortunately misidentified in the book Indian Tomahawks & Frontiersmen Belt Axes, page 45 with no provenance shown other than found in PA. And also one in John Baldwin's Indian War Clubs of the American Frontier book pg 35. I have seen at least 50 of these and the heads are all identical in size, shape and weight & none have any provenance attributable to American Indian usage. They are all made of cast iron which is far too brittle to be used as a tomahawk but works fine as an ice hatchet. Please don't believe everything you see in tomahawk books. Most are listed as having no provenance -- just from other's collections. Very few authors have thoroughly researched what else it could be. It takes work & most don't want to do it. Peterson shows a somewhat similar one (No. 71) in his book American Indian Tomahawks, however notice it has straight angles on the bottom instead of curved like this one. Also Peterson's example has a spike which is triangular in cross section with no fuller reliefs and is hand forged; whereas this example has molded fullers on either side of the blade and has a rounded cross section and is made of cast iron. When closely examined they are very different. The ad below is from an 1883 Catalog of Simmons Hardware Company showing a different handle but the exact same head. The term 'bronzed' was referring to the color of paint on the head. Some I have seen nickel plated also. A number of companies made variations of this with the same head for about 60 years. Here is one cast from an original that used to be sold by a custom knife & tomahawk maker Szilaski. They use methods that do not leave a seam. These are still sold as reproductions to collectors/reenactors, however it doesn't take long to make it look old again & they've been around for over 25 years now. Here is another Szilaski cast repro as above that was aged sold by a Metairie, LA. dealer except this time they knocked a piece of the bowl off to make it look different. They know we are on to them so they have to be more creative. Anytime the pits are in the same places as the repros you know you have a fake. Be aware that they can alter them. I've noticed the more recently cast Szilaski repros have less detail than the ones made 20 some years ago such as this one--no doubt from the mold wearing out. 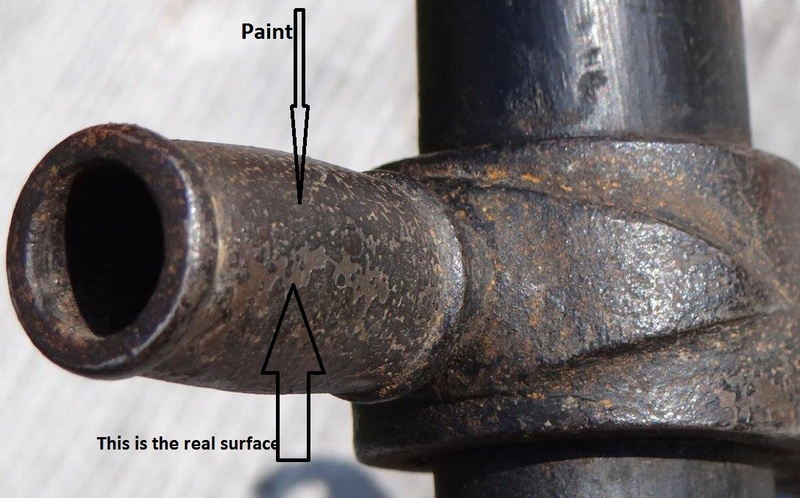 This phony patina was painted on. 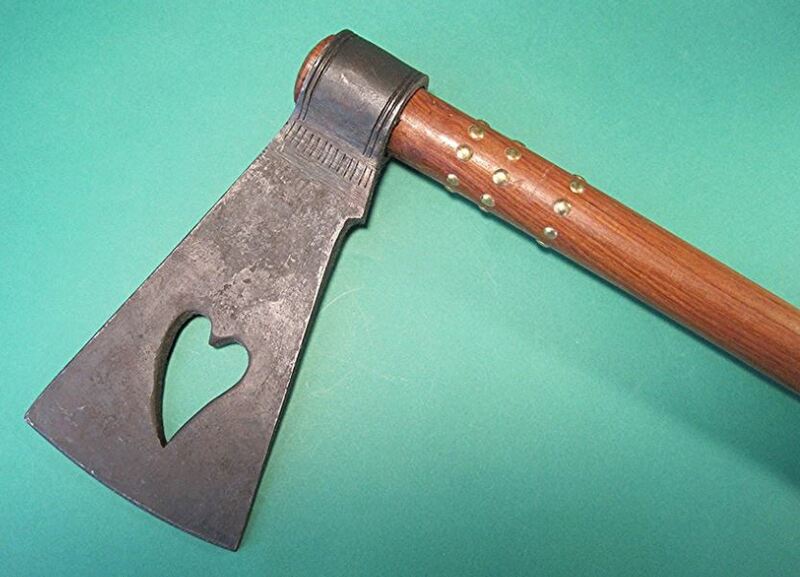 This pipe tomahawk with a heart cut out is frequently rusted, stained & sold as original. 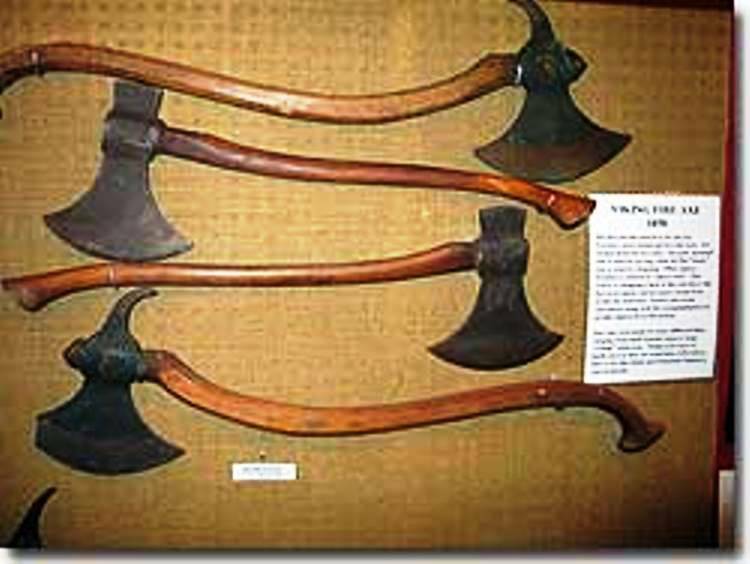 The FASNY Museum makes the following statement: "Fire axes were made of many different sizes, ranging from small hatchet sizes to large “Viking” style or “battle axes” as seen here. 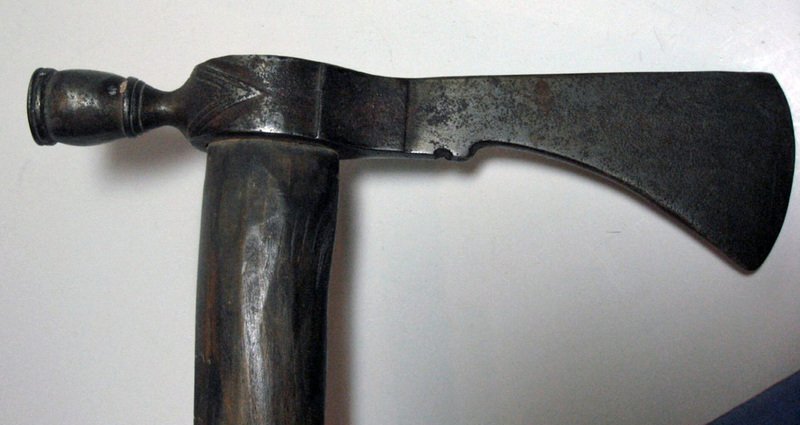 Early axes had a sharp pick on one end for prying and a rounded blade for chopping. The round blade was later replaced by a square edged blade, which was more effective in fighting fires." FIRE AXE FROM PERU! 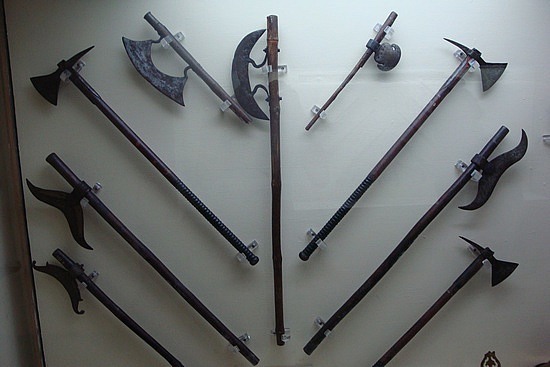 PHOTO COUTESY OF JALEB H.
Here are some battle axes from the New Delhi Museum in India. 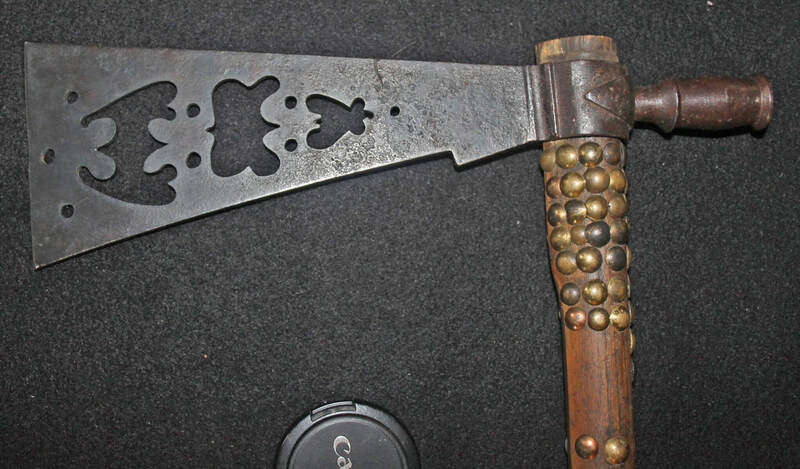 Notice the spike axes here have iron strapping on the sides of the eyes and handles, however sometimes these iron strappings are removable. 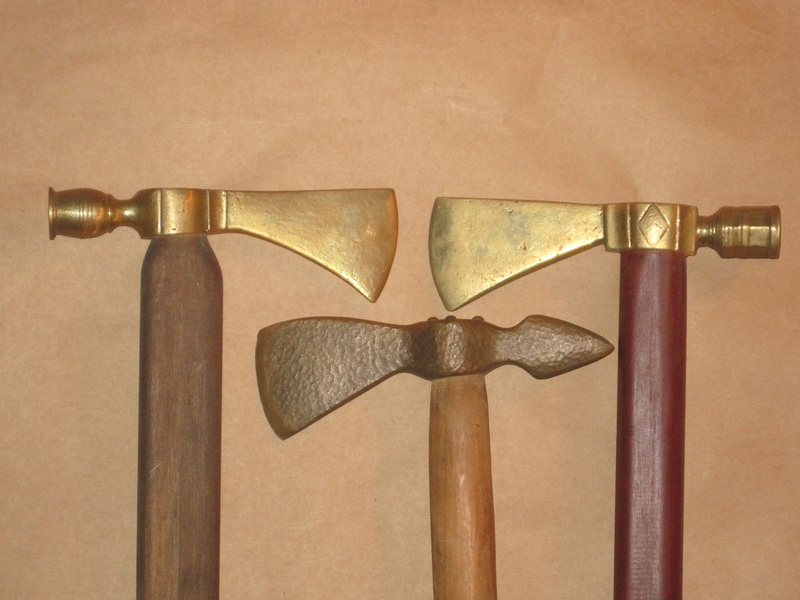 All these types of axes are replicated as well and some (both old ones and new ones) are represented as tomahawks. 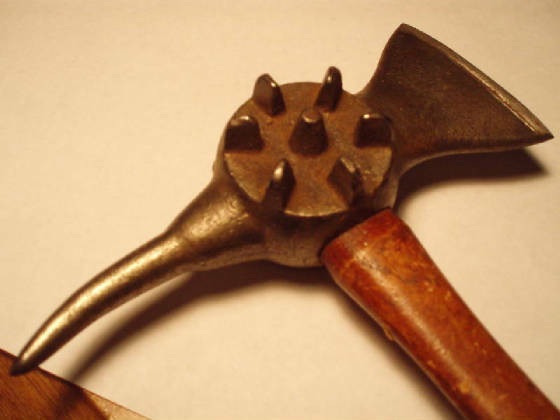 Just because it is old and hand forged doesn't mean it was used in North America. Just because it is here now doesn't mean it didn't arrive yesterday. 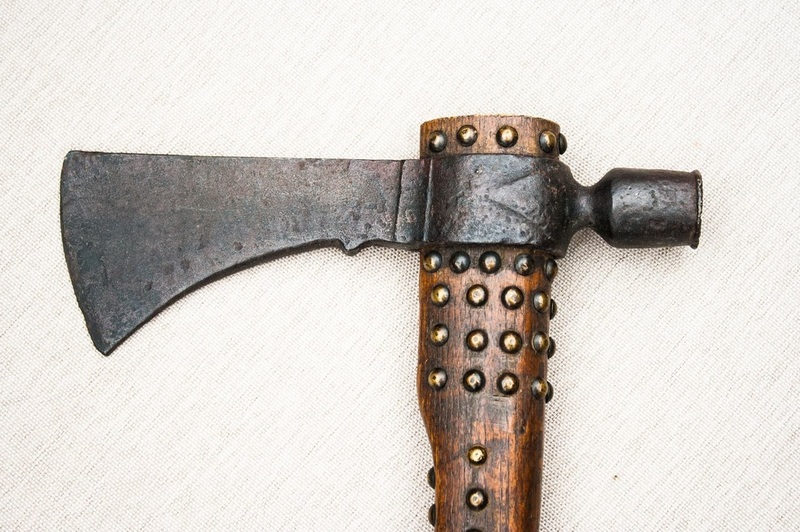 Axes from all over the world have been imported to the U.S. for the last century to make a quick buck. 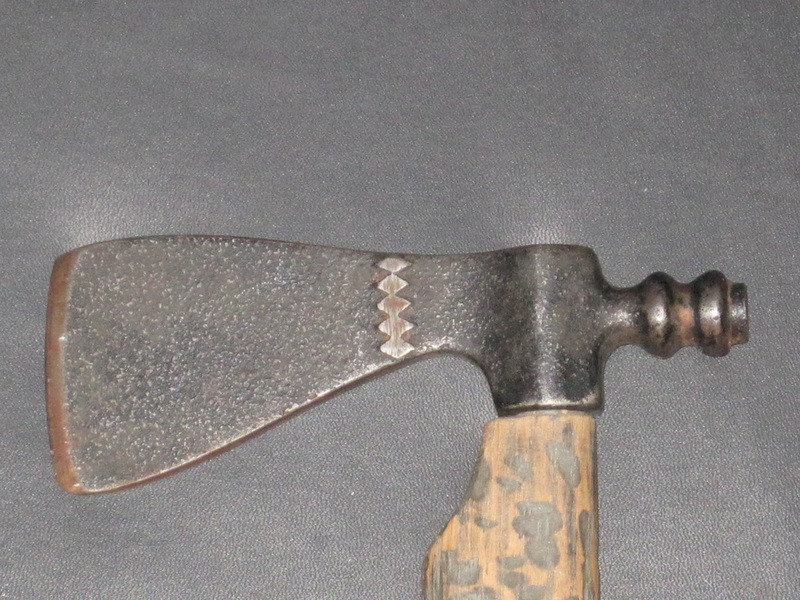 Here is a modern reproduction spike axe I've seen a few times that was artificially aged and stamped in the center with a conjoined HB mark in the middle. Anytime you see HB or HBC marked on a tomahawk it is most certainly fake. Hudson's Bay Company never marked them. A great many items were sold from a privately owned tourist business called the "Kema Indian Museum" owned by Dr. Stephen Mazepa (Chiropractic Doctor). Unfortunately, it was a museum in name only and 80-90% of the items were either reproductions (possibly sold as such at the time), and misidentified Middle Eastern or African items or cobbled together pieces. The 25,000 items were sold at auction in late 2010 and have deluged the Ebay and other auction marketplaces as virtually all authentic because they came from a "museum". What many people don't realize is ANYONE can open a business and name it a museum--that doesn't mean it is one or is run like a public museum would be. You can call the collection in your basement a museum (and some have) but that doesn't make it so. The Kema Indian Museum had no affiliation with any public entity of any kind. Much of the Ebay auction advertising mentions the doctor's name inferring he was an expert on American Indian artifacts however they conveniently never mention he was a Dr. of Chiropractic care only. Misidentified or not they are almost all being sold as original artifacts and will haunt the collecting community for many years to come. Some have called this a hammer polled tomahawk. 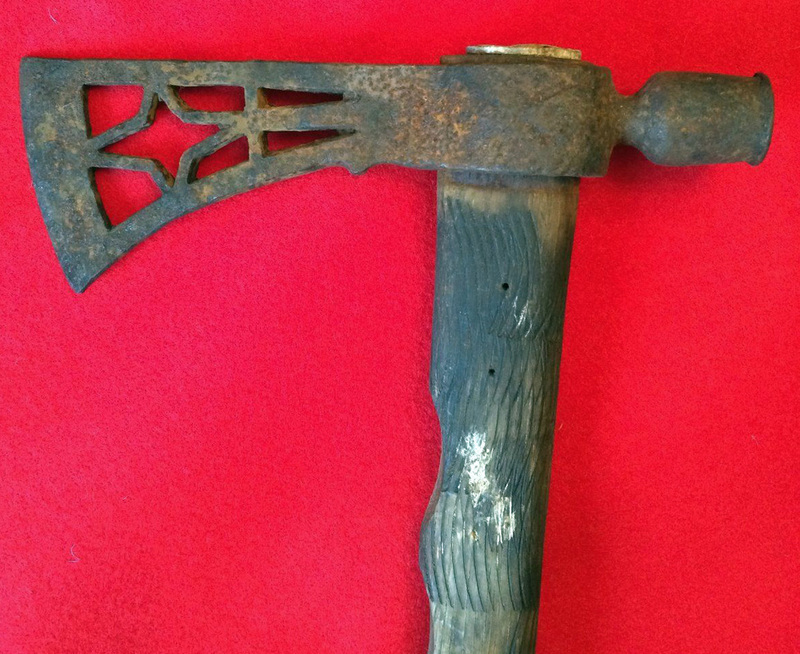 This hatchet might seem too small to be used on a track but it was not a railroad track but a miner's track. The rails were much smaller that went into dug mines to carry the ore. 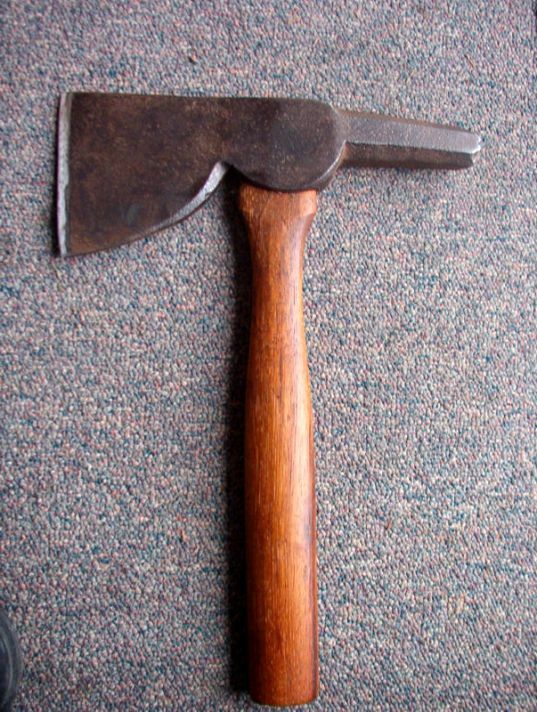 This is a miner's hatchet used for trimming ties and hammering small spikes in them. No nail pulling notch either. These particular forged double & triple batwing pipe tomahawks are made by a couple of makers in Poland (the country) & Czech Republic which some of their North American buyers are rusting them and artificially 'aging' the wood & pewter inlays. Authentic examples are extremely rare & sell for tens of thousands of dollars. Naturally others are making variations of these & aging them to sell as authentic. Here is a triple bat wing I examined that, among other issues, they neglected to age the inside of the cutouts, yet it sold at least a couple of times as authentic for thousands, once by an author. Notice anything else around the edges? Originals were punched out while red hot, not cut with torches or sawn. 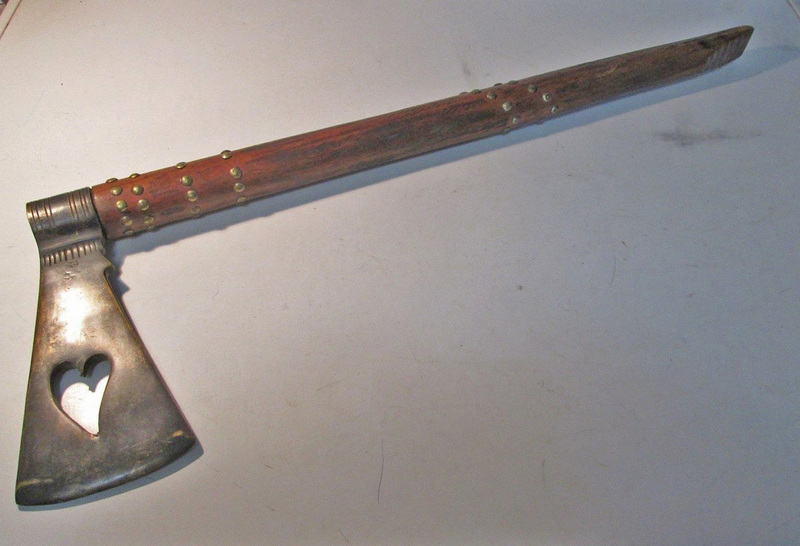 Here is a repro cast Missouri War Axe complete with the tacks & ladder back haft being sold for $33 retail but some are adding HB marks or artificially aging them for thousands. 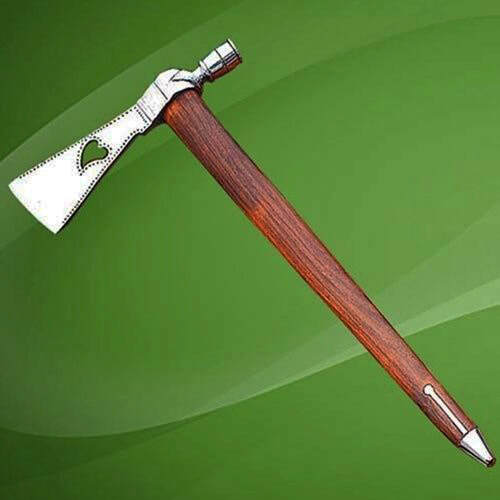 As I write this one sold online for $1,425 with a darkly dyed handle. Many buyers will never know they bought something modern made in India. Same as above. 8.5" X 24.5"